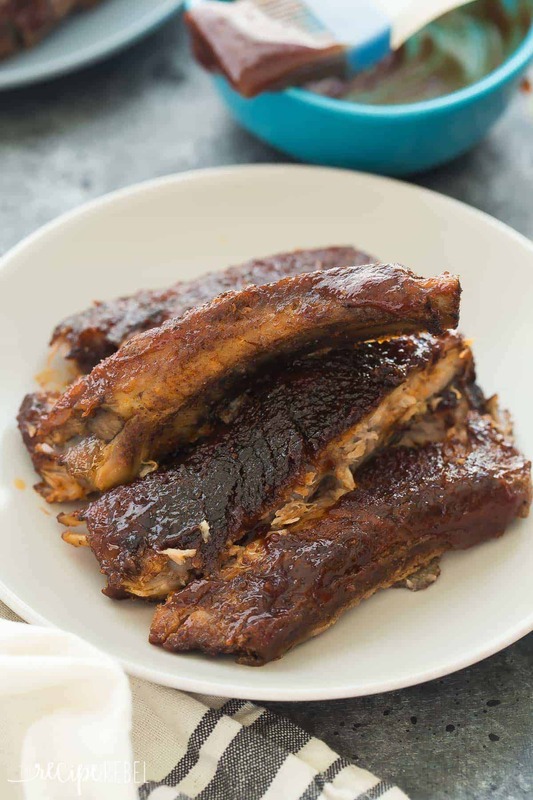 *NOTE: I usually use pork side ribs for this recipe, but baby back ribs should work just as well. If you’d like to remove the membrane from the backside of the ribs (this is optional), you can find a tutorial herea tutorial here. 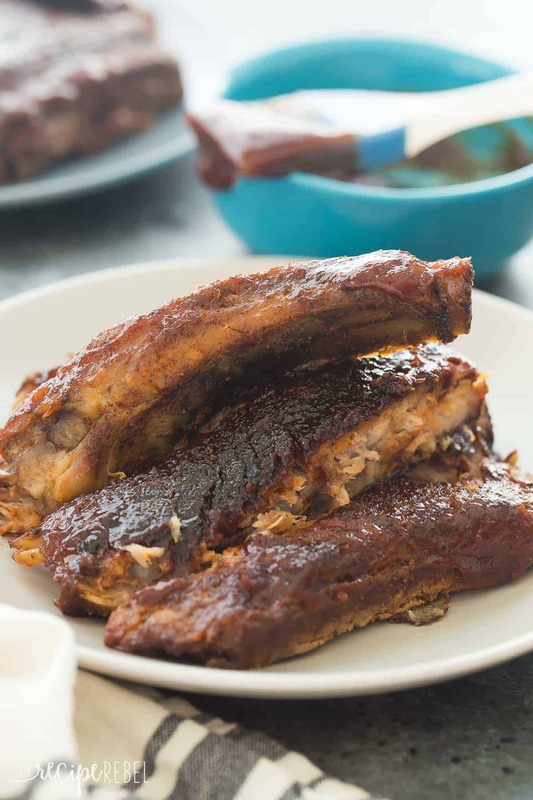 These Easy Slow Cooker BBQ Ribs couldn't be simpler! They have a homemade spice rub and are slow cooked until they fall off the bone, then you can slather them in any barbecue sauce you like! Cut ribs into 4 sections (if desired -- you could leave them whole). Rub spice mixture over both sides of the ribs. 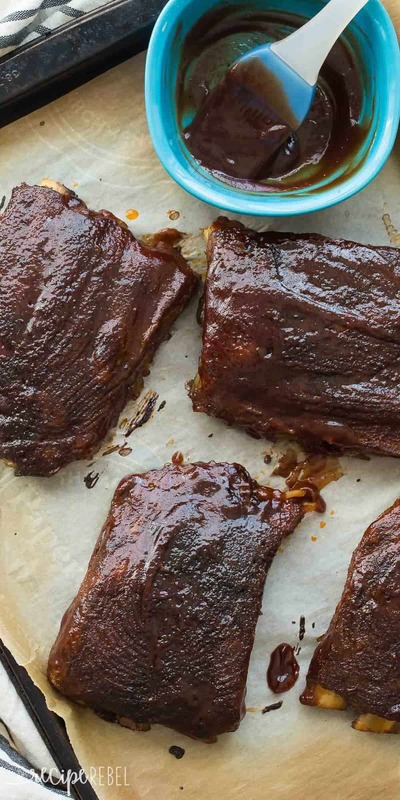 These are better than restaurant ribs! Love the rub and also the pineapple brown sugar BBQ sauce. I’ll never buy jar sauce again. These are so yummy! Thanks Karen! I’m thrilled to hear that! Haven’t made before, I put the rub on tonight, and will be inserting then in the crock pot tomorrow morning as I head off to work. I’m thinking of adding a bit of liquid smoke to get that smoke flavor. That’s a great idea! I hope you like them! I resort to the crock pot once it gets too cold outside to maintain temp in my smoker. I have a large crock pot and have cooked 3 full racks of ribs at a time. The night before after removing the membrane I rub them, wrap them and refrigerate over night. 8-10 hrs or so before I serve them I just trim them to length, stand them on edge and curl them all together drop in the trimmed parts and turn it to low for 8-10 hrs. It’s great to come home from work to ribs! If you add a teaspoon of liquid smoke to your sauce it really gives it that outdoor flavor too! I am definitely going to try these since I still have some homemade barbecue sauce. That will be delicious I’m sure! I’ve never put the ribs along the sides of the crockpot before, is that so they cook differently? It is so they don’t sit in the juices and they get a little crispier being closer to the heat. Have you ever tried grilling them afterward? My family likes that charred flavor, so when I bake my ribs I usually toss them on the grill for a few minutes. Ha! Nevermind, I dug a little deeper. I’ve never tried ribs in a slow cooker. This might be something to try this winter when I don’t want to be outside in the cold. Havetyou doubled up the recipe in a larger crockpot? I need at twice the amount. I haven’t but I’m sure it would work fine! Hello, they need to be thawed first. What are you even talking about? Did anyone call for frozen ribs? Can you cook them in crock pot on high for 4 to 6 hours? Yes, definitely! I think 4 hours would be lots. Did you remove the membrane? Sometimes I do and sometimes I don’t, but I will make a note with instructions for those who want to. There’s tons of flavor already in the rub, it’s not really necessary! Feel free to add some in if you like. I just can’t imagine how it will Taste without salt but I’m excited to try it! I’ll let u know when I do how we like them. Thank you! Do you need to boil or pre-cook them in any way? Nope, definitely not! They cook in the slow cooker. How amazing would these ribs be for a cookout?? I looooove that you can just stick ’em in the crockpot and forget about ’em for awhile! That dry rub sounds SO flavorful! Oh my word, it’s my favorite thing these days! Thanks Sarah!